The Tarot card for today is the Knight of Swords (Drama). Quick thinking, brainstorming, and lots of talk are on the agenda today. On the positive side, this can be a day of exciting mental stimulation and genius ideas. On the other hand, be careful of jumping to conclusions, talking without thinking first, and pettiness just for the “fun” of it. 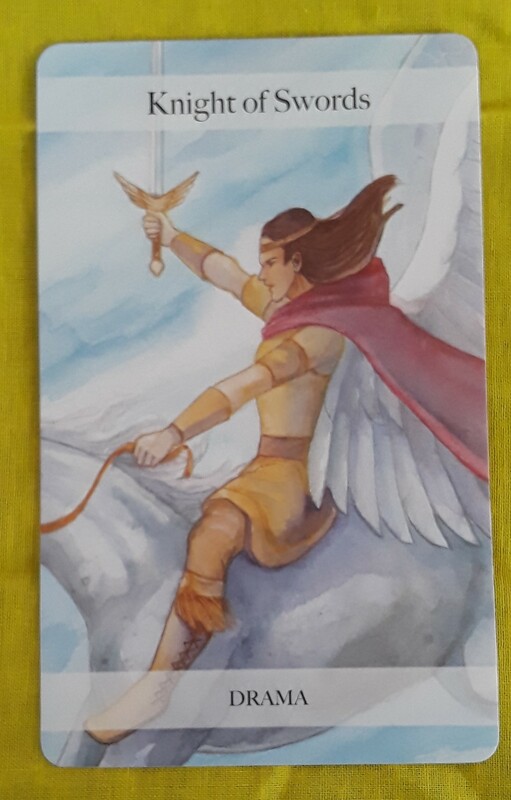 The Tarot card for today is the Knight of Swords. You are energized and ready to go, putting your ideas into action. You may be very busy with your own projects and also other people will bring their ideas to you. Charge full speed ahead — just make sure you don’t trample over anybody or step on their toes! The Tarot card for today is the Knight of Swords. Yesterday we had a Knight as well, so this week is full of action and youthful energy, which we all can take advantage of — no matter what our age. With the Knight of Swords, the focus is on sharp thinking and the urge to communicate ideas. You may also feel the need to physically move around a lot while you are getting things done. There may be a tendency to move too quickly in action and thought. Try to take the time to consider what you are doing before you rush ahead and to take a few seconds to think before you speak. Hi, all! The Tarot card for today is the Knight of Swords. The suit of Swords represents mental activity and communication. So you may have lots of ideas in your head that you want communicate to the world. However, it just so happens that today is the beginning of a Mercury retrograde, which in astrology is associated with conflicts, mix-ups, and arguments, among other things. So be careful with your words. It’s not what you say but how you say it. You could be like the character shown on the Knight of Swords card, rushing into a situation with your sword drawn. Instead, think about who you are talking to and how your want to represent yourself. Good morning, everybody! 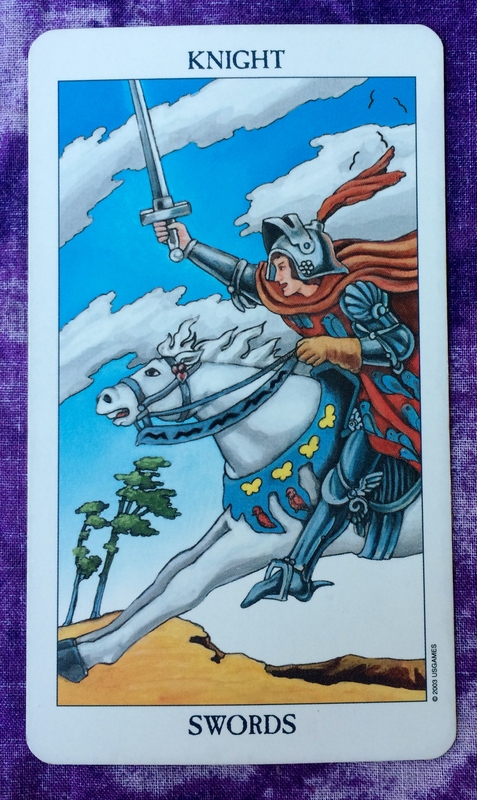 Today’s Tarot card is the Knight of Swords. You have a lot on your mind or maybe somebody around you has a lot of nervous energy. Not only do you or the other person have plenty of ideas, but you also want to talk about them. A lot. When you express your thoughts, you may become an inspiration to someone else. If there is anything to watch out for, make sure that you don’t say something that could be taken the wrong way and hurt somebody’s feelings. And if somebody says something to irritate you, don’t take it personally. Hello, everyone! 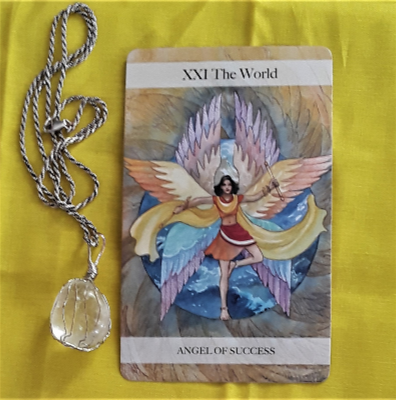 In addition to talking about the card I drew, I’m also going to talk a little about today’s new moon and some major astrological events that are happening this week. Although I am not an astrologer, I would be remiss if I didn’t mention these amazing events going on in the sky. Bur first, today’s card is the Knight of Swords. This is all about new ideas, new beliefs, and the need to communicate these thoughts and beliefs to others. This is a mighty gust of mental energy, so ride like the wind! Today we have a powerful new moon in Sagittarius during a week of some of the most most incredible astrological transits ever. First, as is the case with every new moon, the sun and the moon are aligned. But today’s new moon also is aligned with the galactic center. Basically, the galactic center is where the the black hole of our Milky Way galaxy is located. Black holes have a tremendously strong gravitational pull — so strong that once something is sucked into it, nothing, not even light, can come out. 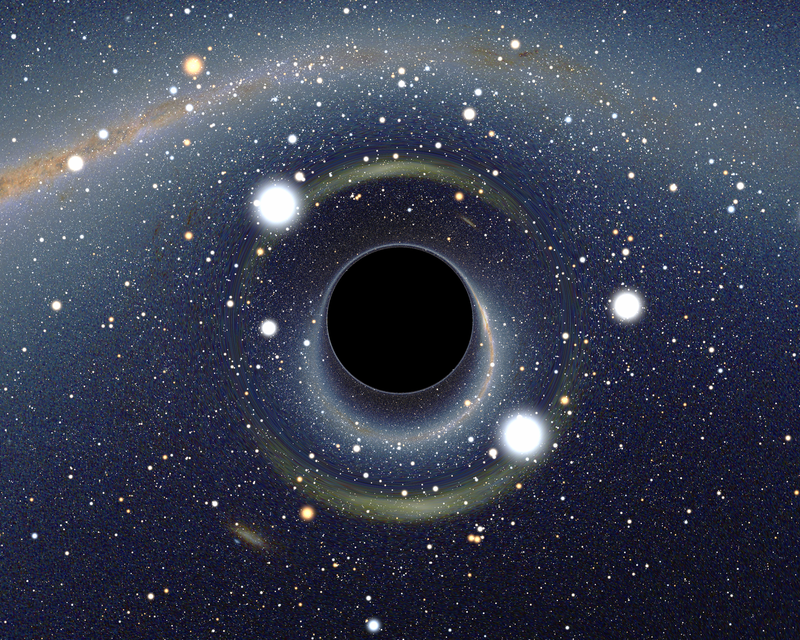 Some people have speculated that inside a black hole exists a brand new galaxy or universe. If that weren’t enough, the planet Saturn transits into the sign of Capricorn tomorrow. Saturn is thought to be an agent of karmic destiny and is particularly powerful in its natural home of Capricorn. Saturn hasn’t been in the sign of Capricorn for about 30 years, so this is a big deal. Saturn will be in Capricorn for the next two and a half years, marking an interesting period in our lives. Also of note, later on this week, we have the Winter Solstice and the Sun changing signs into Capricorn. Wow! So to sum it up, today’s new moon can spark the beginning of a brand new world. On any other day drawing the Knight of Swords, I might give a warning about being too reckless. But I won’t do that today! With this Knight of Swords energy, don’t hold back. THINK BIG!